Have you ever met such problems? If so, you would be puzzled since there is not easy to make a DVD of a video on SD card. If you have no idea to solve the problem, this post will provide you with an effective solution for reference on how to convert SD card to DVD. Part 1. Why need to convert SD card to DVD? SD card, short for Secure Digital card, is the memory card for capacity, which is often used for some portable devices such as smartphones, digital camera, video recording, etc. With the increasingly wide use of HD digital camera or camcorder for shooting videos, the high definition home video becomes more and more popular. Though the SD card is in small size and easy to carry, it is equally limited in the capacity and easy to be lost. What’s more, for some high definition home videos shot by the camcoders or HD cameras, their large size will occupy so much space of SD card. To solve these problems and get more fun and enjoyment, you are strongly recommended to convert SD card to DVD. But how to burn DVD video from SD card may make users confused like the question above. To get to know how to convert SD card to DVD, to make full use of SD Card to DVD burner is hanging over our head. 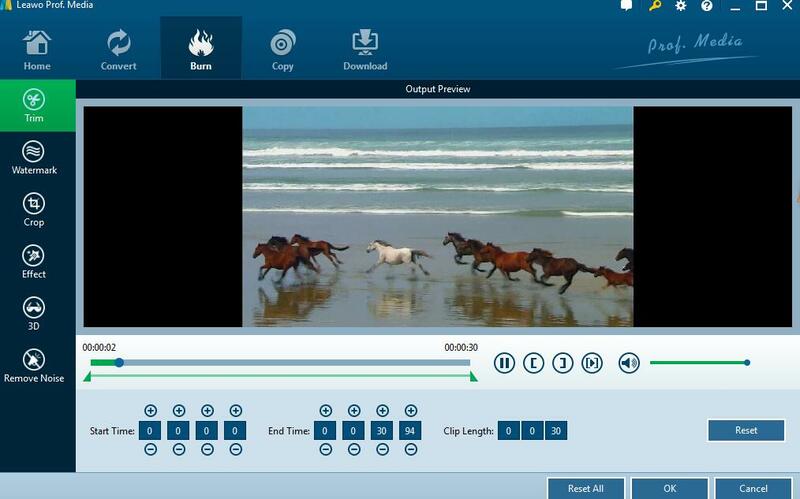 As one of the most valuable and helpful DVD burner software app, Leawo DVD Creator is particularly designed to convert video to DVD. It supports over 180 formats, like Videos formats such as AVI, MKV, MP4, WMV, Xvid, MOV, and FLV can be burnt to DVD-9 and DVD-5 discs. With this program, you can also simply create DVD from all kinds of videos from SD cards shot by HD digital camera or camcorder and burn DVD video from SD Card. Before you get started to burn SD Card videos to DVD, you should insert the SD card into the computer’s card slot if your computer has an internal card reader, or directly connect your camera/camcorder to the computer with USB cable, and then transfer the video files from SD Card and paste them onto to the hard drive. Once finished, Download and set up the SD Card to DVD burner—Leawo DVD Creator, follow the instructions step-by-step below to transfer files from SD Card to DVD. Add videos to the DVD creating software by clicking the “Add Video” button to load videos or “Add video Folder” to import video folders, or drag and drop files to the program in the direct. When finished loading source video files, you could also set the output DVD disc type (DVD-5 or DVD-9), quality and aspect ratio (16:9 or 4:3) at the bottom. STEP 2: Optional Disc menu Settings. 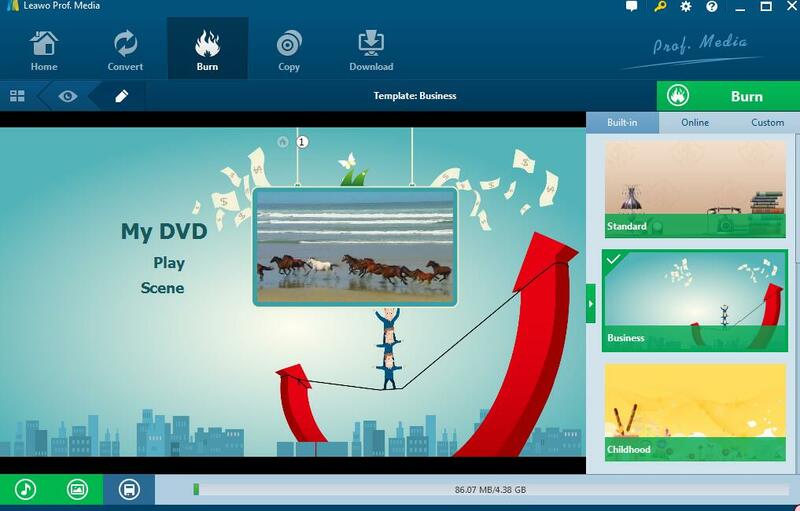 On the right sidebar, DVD Creator provides you with multiple preset menu templates with different themes such as Standard, Business, Education, Childhood, Holiday, etc. If necessary to add disc menu to the output DVD movie, you could choose one as your favorite. 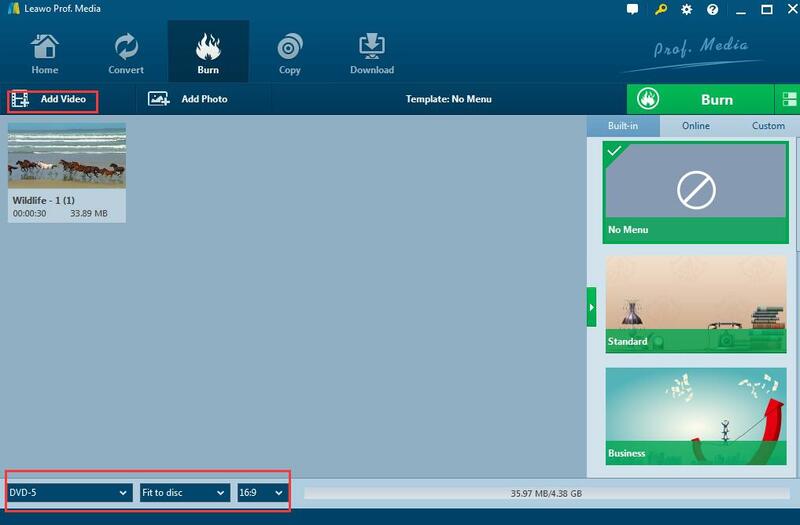 Moreover, it allows you to design disc menu with your own images and audios by yourself. “No Menu” option is available as well. The loaded video file on the dashboard can be edited by clicking the “Edit” icon, and calling out the video editing panel to edit the loaded videos and customize the output DVD videos. What’s more, you could also right click a loaded video, and then select Edit option to enter the editing panel where you can trim video length to cut video length, or set values in Start Time and End Time, add video watermark on your video with the right position via drag-and-drop on the preview panel, crop video size and adjust video effect to directly drag the sliders of Brightness, Contrast, Saturation and Volume Zoom to reach to the required effect. After you select your targeted disc menu, click the big green “Burn” button and the burning settings panel will pop up, where you are required to figure out Burn to, Disc Label, and Save to options. When the burning settings figured out, click the “Burn” button at the bottom of the burning settings panel to start to burn SD Card videos to DVD. DVD Creator will instantly begin to burn and finally finish burning DVD video from SD Card in a few minutes. All in all, once the DVD creator finished the burning, which means you have burn SD Card videos to DVD and transferred files from SD Card to DVD as well. Then you can watch the DVD disc on your home DVD player. Since you have known how to make use of the SD Card to DVD burner or so-called DVD Creator to convert SD card to DVD, you can have fun for anytime or anywhere to shoot videos with your camera or camcorder.